We supply Melbourne’s best quality and largest range of non slip pool pavers to all Melbourne, Sydney suburbs and Victorian ans NSW towns. We can also organise for independent qualified pool tilers and pool tiling stonemasons to quote your project free of charge if renovating your swimming pool (Melbourne area only). Whilst we are based in Melbourne, because of our vast range of pool pavers and pool tiles compared to our competitors smaller ranges we often deliver door to door our pool pavers Australia wide. To our many Sydney, Brisbane, Adelaide and Canberra and country clients, we offer free samples to help you decide on your natural stone pool pavers and pool coping tiles. Stone & Slate Discounts proudly stock Australia’s premium bluestone pool pavers, genuine HARKAWAY BLUESTONE (as seen in the picture above). Our range of pool pavers tiles and stone pavers have been specifically sourced by our stonemason’s to be: non slip, have an extremely high tolerance to salt attack and will not fade over time. 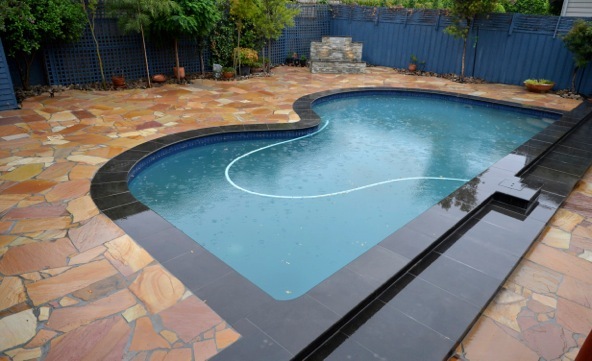 All the above natural stone pool pavers are stocked in Melbourne. They are sold at Melbourne’s best wholesale prices for quality stone swimming pool pavers and swimming pool coping direct to the public all over AUSTRALIA.